One of the most obvious features of walking as a research methodology is that it is slow. When I walk on the flat, say down a road, and I know where I am going, so don’t have to think about the route, I walk approximately four miles an hour (6km/h), compared with say 40 mph (65 km/h) driving down country roads, 70mph (110 km/h) the maximum (legal) speed on a British motorway, or 500mph (800 km/h) in a plane. In an age addicted to speed, walking is unconscionably slow, but the very slowness creates its own pace and forces you to notice things you might otherwise miss, and to experience places you might otherwise speed through. Combined with the systematic nature of the coastal path, this meant I saw things and areas I would have been unlikely to deliberately visit. This was particularly obvious in the Dee Estuary in the north east of Wales, a very depressed and not at all pretty area, but one where I learnt such a lot. In other areas there has been an increasing appreciation of the value of ‘slow’. This began with ‘Slow Food’ in Italy in 1986, but became more widespread with a broader ‘slow movement’ following Karl Honoré’s “In Praise of Slow” [Ho04]. In the mid 2000s I led a mini-project on “Slow Time” trying to help people become aware of the slower rhythms of life: milliHz (about 20 mins), microHz (about 12 days) and nanoHz (30 years) [DP06]. This was in turn inspired in part by Stuart Brandt’s “How Buildings Learn”, which explored the different timescales of domestic architecture [Br97]. Although I had planned for this to be a ‘slow’ experience, in fact one of the pervading memories is of feeling rushed. My four mile an hour walking pace on flat roads that I know, became two miles an hour on rough ground, where I needed to navigate and was taking hundreds of photographs a day. This was exactly the speed the Ramblers, those who walk regularly as a hobby, had told me to expect, but I had ignored this expert knowledge. Distances I had expected to take 4-5 hours a day to walk were taking 8-10 hours, As I had fixed the overall duration of the walk, I could not simply take more time, so for a long time the walk exhibited the same feelings of stress and time constraint as my normal academic life. Slow is not simply a matter of walking. It also hurt. Not all the time, and my feet were remarkably blister free, with just five sticking plasters used the entire journey. However, in the middle section especially, various long-term aches and pains emerged, and it took my feet approximately a month to recover after I finished. There are ethical issues here even when the task is freely chosen, but certainly you could not demand this kind of thing of a student. However, an element of discomfort and risk is common in many other areas of research from anthropology to vulcanology. One of the aims of the walk was to engage with local people and communities. The slow element was part of this, and one of the aspects compromised by the time constraints (not slow enough). However, this was also problematic due to my personality. Although I can talk endlessly, I find it very hard to start a conversation, especially with a stranger. 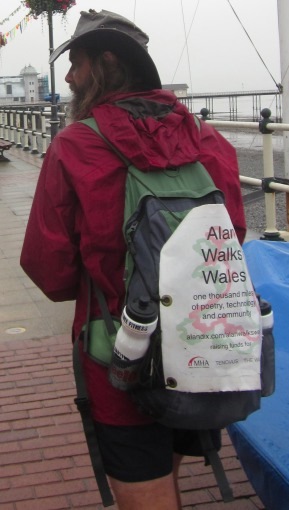 During the walk I wore a banner strapped to my rucksack. The banner meant that other people would initiate conversation, asking me about the banner. It also lent an element of ‘officialness’; I was not simply sitting or walking, but someone on a mission. The banner is an example of what I call ‘personality prosthesis’. You might have an artificial leg or arm fitted if you have had an accident, or simply wear glasses. Even if we have no impairment, we use various forms of physical prostheses to augment our bodies, using a forklift truck or block and tackle to lift weights too heavy for us, or car to move faster than our legs would carry us. We also use cognitive prostheses, a calculator to augment our mental arithmetic, or diary to help our memory. Although you might attend a gym or night classes to improve aspects of your physical or mental capabilities, there is no great shame in using these physical or cognitive prostheses. However, when it comes to aspects of personality or cognitive style, people very rapidly fall into a language of moral failing, “if I were a more tidy person …”, “if I were more organised …”. Our underlying personality is not going to change easily, if at all (although maybe we can shape our character), so complaining about it is like an engineer saying “if only this steel were fifteen times stronger”. As a designer faced with a material with limitations, we would work to achieve our aims given the limitations. The banner was precisely that. If I were more extrovert, more gregarious, I would find it easy to strike up the conversations I wanted to. But I am not. The banner helped me to achieve the aims given who I am. Never apologise for who you are, only for what you do.